Guest Interview: Felix Biederman (@byyourlogic) discusses his investigative reporting for Deadspin on social media in Saudi Arabia, as well as the broader geopolitical future of the Gulf’s biggest kingdom and the US-Saudi alliance. Produced: Jan 15th, 2017. – For marginalized people, is Silicon Valley tech a liberator from or enforcer of the status quo in Saudi Arabia? Can US consultants really modernize the kingdom? – What is going on with Saudi Arabia’s war in Yemen – and US media coverage of it? – Would a US alliance with Iran be preferable to the current alliance with Saudi Arabia? – Is it possible to safely disentangle US-Saudi ties without blowback and catastrophic meltdown? Op-Ed | Does Saudi Arabia Want to Break Up Yemen? Saudi Arabia’s war in Yemen against various rebel factions has come to involve ground troops from the UAE, Qatar, Egypt, Sudan, as well as various countries’ jets. A recent ceasefire seems doomed to fail. And yet it has taken a full year for the Saudi government to present even the flimsiest explanation of its reasons for undertaking the war to begin with or to mount a public defense of the war’s course. It came in the form of an ungrounded, feel-good propaganda piece by Ambassador to the United States Prince Abdullah Al-Saud in the pages of the Wall Street Journal in March 2016. I was out of government service when the operation was launched. So like many Saudis, I wondered why the kingdom had taken this unusually bold action. Remarkably, despite an incoherent raison d’être, the Saudi-led coalition operates with substantial logistical and munitions support from the United States. And despite the potent weaponry brought to bear, as we projected last year, the campaign has failed to re-take much beyond a (fragile) southern beachhead. Did the Saudi coalition have a backup plan if a broader takeover failed? A possible solution, to Saudi planners, appears to be splitting the country up. Such an intended outcome may sound exaggerated or alarmist. However, those who are familiar with Yemen’s history over the last several decades would not be surprised if it emerges that an unacknowledged goal of Saudi Arabia’s war is partition. Yemen, a very poor country that was widely seen before the war as a paradigm for a failed state, sits across a 1,100 mile long border from wealthy, powerful Saudi Arabia. Yemen’s population – about 27 million – is nearly the same size as Saudi Arabia’s (26 million), even though the former’s territory is only 1/4th that of its much richer neighbor to the north. Meanwhile, Yemen’s per capita income is only 1/20th of Saudi Arabia’s. At their root, Yemen’s challenges are socio-economic in character. Attempting to bomb them away, as Saudi Arabia has tried for some time now, are doomed. When Yemen’s Saudi-imposed post-Arab Spring political solution was overthrown, the Saudis decided in March of 2015 to plunge themselves into the conflict in Yemen. Just like the Americans in Iraq, Afghanistan and beyond, they counted on the superiority of their armaments and war technology to win the war quickly – and finally resolve that persistent problem next door. The only real effect of the Saudi air campaign, however, has been to destroy whatever little infrastructure Yemen had before. Highways, bridges, ports, even water pipelines have been sacrificed by Saudi policymakers, putting Yemen’s future economic potential ever deeper into a hole. The later introduction of ground troops from a constellation of Arab countries did little to improve the picture. As this campaign unfolds, Yemen will only be more broken and unable to generate any realistic prospect for jobs or wealth. Why then did Saudi Arabia pursue such a strategy? The conventional wisdom is that it simply followed the U.S. path – unwisely overestimating the power of high-tech warfare. But the Saudis, famed for their interest in preserving regional balance, have long had a front-row seat to the rather disastrous unfolding of America’s strategy in the region. They may be stubborn, but they certainly are not stupid. Moreover, the argument that Saudi Arabia just followed the U.S. example does not account for the extent of the physical and human devastation from Saudi raids and naval blockade. Thousands of people went hungry for half a year or more and 20 million lack safe drinking water. Thousands of civilians have been killed in very poorly targeted airstrikes, including many by Saudi aircraft flying too high for accurate bombing to be possible. Considering the widespread destitution that was already present in Yemen before any Saudi actions, it is incomprehensible what the shattering devastation produced in the past year should possibly yield, with regard to the stated goal of intervening to stabilize Yemen. How does that align with the interests of the United States? In short, it does not. U.S. policy, right or not, has been that preserving existing borders at all costs is the way to maintain regional stability. In contrast, Saudi Arabia – a nation of formerly nomadic peoples in a theocratic system that never cared much for earthly borders – seems to prefer a divide-and-conquer strategy. That is hardly in Washington’s interest. Nor is it really in the Saudis’ interest. And yet, that may be precisely what is happening. One only need look to Libya’s recent past to see where this strategy will lead. Consider it Yemen’s prologue under the current course. In Libya, Egyptian and UAE bombardments have not re-united the country’s historic rival halves. Rather, they hardened the partition between them. And in that Libyan breach, ISIS established its most active “provinces” outside of the Syria-Iraq battlefields. Such a scenario next door in Yemen is the last thing that Saudi Arabia, a giant who stands on clay feet, needs to create. U.S. interests demand that the Obama administration does not let the Saudis, no matter how important an ally they are, go unperturbed about its evidently disastrous – and inhumane – strategic path. Investigative journalist Gareth Porter continues his work poking holes in the accepted media narrative that Yemen’s current war is actually a fight between Saudi Arabia and Iran. And when we say “awash with modern arms,” let’s remember Yemen is awash with them from Saudi Arabia. And they’re dropping off a lot more in this new war. 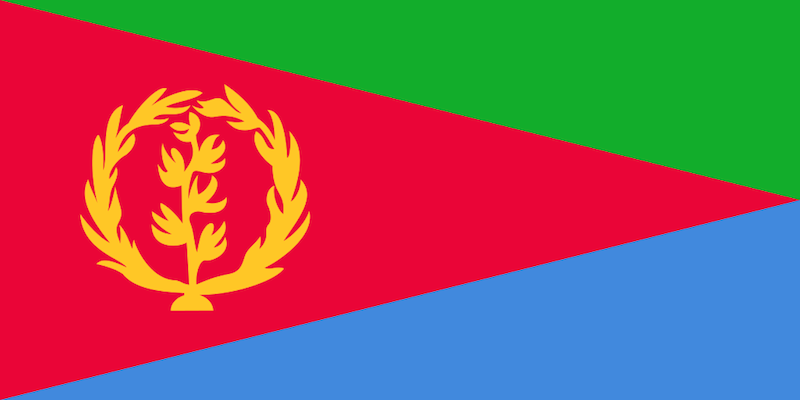 Eritrea now joins fellow African states Sudan, Egypt, and Morocco in the Saudi quagmire in Yemen, along with several Gulf states. You’ve probably heard of the FIFA World Cup in Qatar (which never should have been awarded to Qatar) being moved to the winter to avoid scorching stadium temperatures. You might also have heard of the devastating heat waves this past summer from Lebanon to Iran. Will the Persian Gulf region and Arabian Peninsula be uninhabitably hot later this century (without significant action on climate change soon)? A new study published in Nature Climate Change journal argues so. 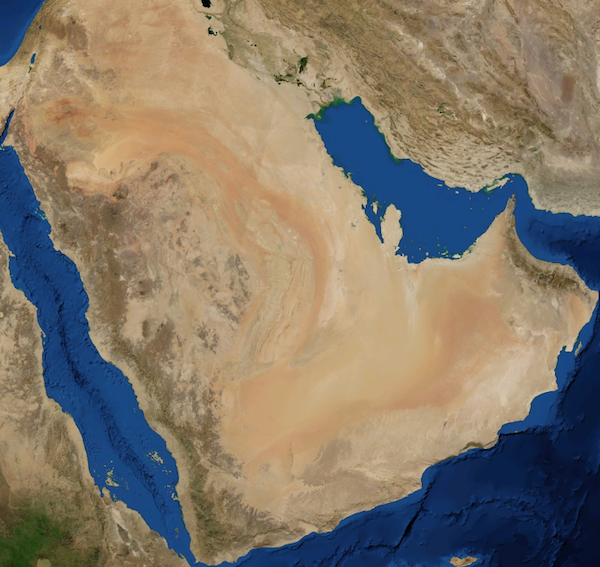 Satellite photograph of the Arabian Desert from NASA World Wind 1.4. The study shows the extreme heatwaves, more intense than anything ever experienced on Earth, would kick in after 2070 and that the hottest days of today would by then be a near-daily occurrence. They said the future climate for many locations in the Gulf would be like today’s extreme climate in the desert of Northern Afar, on the African side of the Red Sea, where there are no permanent human settlements at all. But the research also showed that cutting greenhouse gas emissions now could avoid this fate. The new research examined how a combined measure of temperature and humidity, called wet bulb temperature (WBT), would increase if carbon emissions continue on current trends and the world warms by 4C this century.